Thunderbolt 3 GPU enclosure producer Sonnet has unveiled a new display-oriented accessory, with the Thunderbolt 3 to Dual HDMI 2.0 Adapter able to add two 4K-capable video outputs to a MacBook Pro or iMac while using up only one Thunderbolt 3 port. The Thunderbolt 3 to Dual HDMI 2.0 Adapter consists of an enclosure housing two HDMI 2.0 ports with a permanently attached cable, terminating in an Thunderbolt 3 connection. The adapter is claimed to be a plug-and-play solution with native macOS support, allowing users to start using it straight away after plugging it into the host MacBook Pro or other compatible desktop. Each of the dual HDMI 2.0 ports are capable of producing a 4K image at 60 hertz, with both able to be used at that resolution and refresh rate simultaneously. The device also supports lower resolutions, including 1080p, 1920 by 1200, and 1024 by 768. The display adapter also includes support for audio over HDMI, allowing compatible monitors with built-in speakers to play audio without requiring a separate cabled connection to the host system. 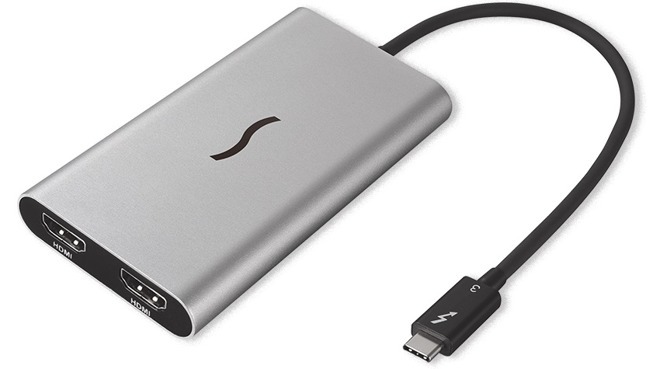 Sonnet also claims that, despite connecting over Thunderbolt 3, the adapter will not drain system resources or impact performance, unlike USB-based video adapters. The entire assembly is also quite compact, with the enclosure measuring 2.3 by 3.9 by 0.6 inches and the cable section measuring 11.8 inches. The Sonnet Thunderbolt 3 to Dual HDMI 2.0 Adapter is available to purchase now from Sonnet for $89.90. Third-party resellers on Amazon also have the adapter in stock for as low as $92.60 with free shipping. Aside from requiring a Mac with Thunderbolt 3 ports, the adapter also requires macOS 10.12.6 or later in order to function.